“In addition to the timbre itself, Tebaldi had an innate feel for how this music should go, for the ebb and flow of every phrase. She also was a mistress of dynamic range. Yes, she could (and did) float glorious pianissimi and she could open up with a full throated fortissimo that remained full-bodied. But where she differed from so many is in all the dynamics in between the two extremes. This allowed her to characterize the music with dynamic variety, rather than Callas-like specificity of inflection. Of course Callas’ Tosca remains an extraordinary musical-dramatic experience, but one should not fall into the trap of believing received wisdom that Tebaldi was not an effective actress. Tebaldi sang with genuine dramatic involvement and with a sincerity that always moved an audience. In my experience, no soprano (not even Callas) could break your heart the way Tebaldi di at ‘Dio mi perdona. Egli vede ch’io piange’ (‘God will forgive me. He’ll see that I am crying’). 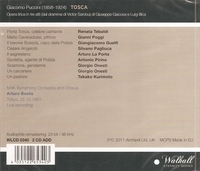 This is Tosca’s response to Scarpia’s hypocritical ‘In chiesa - after Tosca’s outburst in the first act....Tebaldi begins her response with a heartbreaking pianissimo, and a crescendo starting on ‘vede’ that explodes on ‘piango’.” It will tear your gut out. I heard Tebaldi many times, as a standee at the old Metropolitan Opera House from the mid-1950s through the early 1960s, and I never stopped marveling at the sheer beauty of the voice, her ability to project a pianissimo throughout the auditorium so that even though the note was extraordinarily soft, it sounded as if she were standing right next to you. The plushness of tone was probably the most unique feature of her singing, and along with that an innate sense of the appropriate shape of the phrase she was singing. "Poggi is at his best in the shout-em-out-of-the-theatre arias....pealed out with trumpet clarity." "Giangiacomo Guelfi [not to be confused with Carlo Guelfi, a younger baritone] studied at the Centro Lirico in Florence, as well as with legendary Italian baritone Titta Ruffo, and made his opera debut in the title role of Verdi's RIGOLETTO in 1950, an exceptionally young age for such a work. He won the Spoleto Experimental Theater Prize and made his La Scala debut in 1952 as The Visitor in Castro's PROSERPINA Y EL EXTRANJERO. He made his London debut two years later at Drury Lane as GÃ©rard in Giordano's ANDREA CHENIER. Though he drew considerable acclaim in a 1957 performance of Verdi's I DUE FOSCARI in Venice, and he was considered a rising star during the late '50s and early '60s, it was not until his 1964 performance of Verdi's MACBETH at La Scala that he was acknowledged as a full-fledged star. He made his Metropolitan debut in 1970 as Scarpia. He was particularly admired during his prime for his powerful voice, but like many possessors of such voices, occasionally indulged in bellowing and, toward the end of his career, relied excessively on extra-musical vocal effects."